What is Linux (for PlayStation 2) ? Availability ; When, Where and Pricing ? Who is it aimed at ? What is in the kit ? What does the kit look like ? What else is required to run Linux (for PlayStation 2)? How does this distribution work and what is it based on? Are there any other distributions I can use? What is NOT in the kit ? What is on the DVD discs ? Does the kit come with a manual ? Is the HDD compatible with PlayStation 2 Games ? Can I use the HDD as an IDE drive in my PC? Can I play PlayStation 2 Games under Linux (for PlayStation 2) ? Can I play networked games online using the Network Adaptor? Are the SCPH-50000 model range of PlayStation 2s compatible with the Linux kit? Does the new slim SCPH-70000 series PlayStation 2 work with the Linux kit? What does the EULA actually mean ? Can I program PlayStation 2 Games under Linux (for PlayStation 2) ? How do I get started? What are the differences between the Linux (for PlayStation 2) development environment and that used by professional game developers? Will experience with Linux (for PlayStation 2) help me get a job in game development? Can I sell games or software that I develop using Linux (for PlayStation 2) ? Is the PlayStation 2 specific hardware available under Linux (for PlayStation 2)? Where can I get hold of the hardware system manuals ? Can I use a TV as my display ? Which Display Resolutions are supported ? Can I use the monitor cable with commercial PlayStation 2 games and a monitor ? Can I use the DUALSHOCK®2 and Memory Card (8MB) (for PlayStation 2) under Linux (for PlayStation 2) ? Can I upgrade the RAM on my PlayStation 2 ? Can I read my own CD-R discs using Linux (for PlayStation 2) ? Can I use the DVD Video Player while operating Linux (for PlayStation 2)? Can I play my MP3 and OGG files using Linux (for PlayStation 2) ? Can I "rip" CD Audio using Linux (for PlayStation 2) ? Can I play CD audio discs using Linux (for PlayStation 2)? Can I upgrade the kernel ? I thought Linux was free - so why are you selling it ? I have a Network Adaptor, USB keyboard, and hard drive; I just want the DVDs separately! Which monitors are supported and what is "sync on green" ? I want to connect to the internet via my PC, what do I do? I try to start X and it fails with err no. 146? I'm learning how to use Linux, is there a newbie guide? I'm not sure how to change my window manager? I want to start X Windows in PAL or NTSC on my TV, how do I do that? I'd like to chat with other PS2Linux owners. The Linux kit (for PlayStation 2) allows you to use your PlayStation®2 computer entertainment system as a fully functional desktop computer. The addition of an internal hard disc drive (for PlayStation 2) (HDD), a keyboard, mouse and computer monitor (monitor not included) allow you to install and run a wide variety of computer applications that have been written for the Linux operating system. In addition, the kit allows you to develop your own programs that operate on Linux (for PlayStation 2). The kit comes with a broadband network adaptor (Ethernet) (for PlayStation 2). This allows for connection to high speed internet services as well as home PC networks. Availability; When, Where and Pricing ? US & Canada: The North American territory is now sold out of Linux for PlayStation 2. As production has ceased, stock is now permanently sold out for North America. The US PlayStation.com store maintains a page about the Linux kit for informational purposes. Please note that the DVDs are region encoded; a European/PAL disc will be rejected by a US PlayStation 2. Europe, Australia, Africa and the Middle East: http://www.linuxplay.com offer the installation DVDs and the monitor cable for €25 + delivery + tax as a small bundle. Mice, keyboard, HDD and NIC are no longer available. India: http://www.linuxplay.com are able to ship to India. The DVDs and monitor cable are availablel for €25 + delivery + tax, however significant delivery costs apply - please contact linuxkitorders@interactiveideas.com for further details. SCE's Korea office have confirmed they do not have any plans to launch Linux for PlayStation 2. Linux for PlayStation 2 is not available in Brazil or Russia. It will not be available in the future as production has ceased. On 30 January 2002, press releases were issued in North America , Europe and Japan (english language) announcing the release of the kit in territories outside of Japan. The Linux kits sold from each territory (Japan, US, and Europe/Australia/Africa/Middle East) are only for use with a PlayStation 2 sold from that same territory. Linux (for PlayStation 2) is aimed mainly at the hobbyist home computer enthusiast. To install, configure and use the kit, you must be computer literate. We strongly recommend that you have a basic understanding of the Linux operating system before purchasing the product. There are many books on how to use the Linux operating system, some of which have been recommended by users on our discussion forums. Linux (for PlayStation 2) is a great way to learn more about Linux, computers and programming as well as being a powerful development platform for the experienced Linux user. DISC 1 contains the Runtime Environment and the PlayStation 2 System Manuals and is Sony Computer Entertainment Copyright material. DISC 2 contains the Software Packages to be installed. This is the main Linux distribution. Each software package has its own license. Note that the keyboard supplied in the kit is a US format keyboard, even in those kits sold in our territories outside of the US. It's possible to use a different layout by using setxkbmap. Alternatively, any standard USB keyboard should work, so you are welcome to use alternatives. Photo of the various parts that are in the kit . 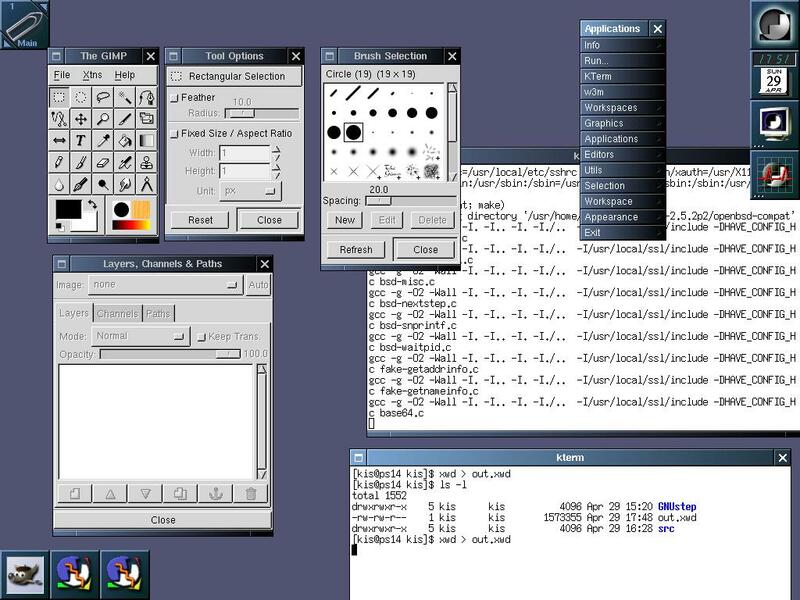 Screen shot of X Windows running on the Linux (for PlayStation 2) kit . 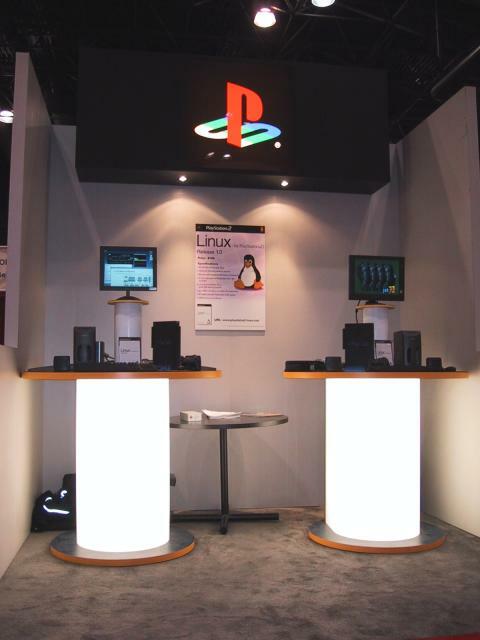 Photo of booth display at LinuxWorld Expo, New York (1/30/2002) . Close up of kit at LinuxWorld Expo, New York (1/30/2002) . (NB: Some of the items shown in the LinuxWorld Expo pictures are for external speakers and LCD monitor box and are not part of the kit) . In addition to the Linux (for PlayStation 2) kit, you must have a retail PlayStation 2, a Memory Card (8MB) (for PlayStation 2) and if you wish to usse a VESA monitor with the kit, it must support "sync-on-green". Please continue to look here for the latest information on compatible monitors as the lists become available. This distribution of Linux is based on Kondara Linux, a Japanese distribution based on Red Hat Linux. Consequently, all the software is packaged in RPMs, and regarding the file system structure, using Linux on the PlayStation 2 feels a lot like using Red Hat installed on a PC (think back to Red Hat 6.2). Those of you from a Debian background may be interested in the Debian based BlackRhino distribution released by xRhino, and/or the APT project for the Linux kit. To boot Linux, you must have Disc 1 of the Linux DVD set in the PlayStation 2 CD/DVD drive. The PlayStation 2 reads it and boots the Run Time Environment, which then allows you to choose which kernel should be booted. The kernel is stored on the memory card, and once loaded, mounts the partitions from the HDD, just as you would expect. You can compile a new kernel, copy it to the memory card, and add it to the boot menu by editing the p2lboot.cnf file on the memory card. Be aware that the versions of most of the common Linux software included are only slightly more recent than those bundled with RedHat 6.2. You can see all the software that is included with the distribution by looking at this list of the RPMS on Disc 2. A full Linux distribution, including tools and install utilities, cannot be used on the PlayStation 2 unless it has been compiled for the hardware. Consequently well known-distributions such as Red Hat, SuSE, and Slackware cannot just be installed at will. The only distribution available for the PlayStation 2 aside from the Red Hat based one provided with the Linux kit is BlackRhino, a port of Debian, maintained by volunteers at xRhino Inc. If you are interested in supporting BlackRhino by submitting packages, you can contact xRhino to request an ftp account for this. Similarly we encourage community members to contact members of the CFYC project if you have built an RPM of a useful software package, and we'll add it to the project, and you can join it if you so wish. The PlayStation 2 console, analog controller (DUALSHOCK®2) and the Memory Card (8M) (for PlayStation 2) are not part of the kit. You can purchase these items separately at a local high street retailer, or order them online via playstation.com depending on your location. The kit does not have an analog modem. If you are in North America and you have the commercial network adaptor sold individually for network gaming, a driver is available for the modem. Certain models of USB modem can be configured for use with Linux (for PlayStation 2). The following list is provided for informational purpose only and represents USB modems which have been reported to work. Due to variations of chipsets used within a manufacturers single model number, your experience may differ. The kit does not include a computer monitor. It also doesn't include any network cable. A full listing of the software packages included on Disc 2 can be found on the community project files page. The Linux (for PlayStation 2) kit comes with a 24-page printed installation manual. The kit also includes PlayStation 2 system manuals and Linux documentation in electronic format on the DVD discs. At the time of writing, the internal hard disk drive (for PlayStation 2) (HDD) is not supported by any PlayStation 2 games in North America and is only sold for use with Linux (for PlayStation 2). In the future, PlayStation 2 games in North America may support the HDD. A HDD with Linux (for PlayStation 2) installed cannot be used with these games. Sony does not support the use of one HDD for both PlayStation 2 games, and Linux, in any territory, and we are not aware of any plans to support this in the future. No. Although the HDD provided in the Linux (for PlayStation 2) kit is based on IDE technology, special changes have been made to the drive for use with the PlayStation 2. Use of the HDD with a PC may cause problems with your PC and may make the HDD inoperable with the PlayStation 2. No. You can still play PlayStation 2 Games by shutting down Linux, inserting the game disc and pressing reset, but you cannot start a commercial game playing from within Linux. In Northern America & Canada (SCEA territory) Linux kit users can contact PlayStation via us.playstation.com to request a startup disc. Some of our users have already done this successfully. In Europe and other SCEE Territories, as the network gaming service is launched in each country, existing customers will receive a network access disc and validation voucher. As of mid June, Linux kits sold in countries where networked gaming has launched will include a network access disc as part of the Linux kit. Existing customers will receive one in the mail (we will mail you to notify you prior to this, should you require to update your address details). Registering your network adaptor using the validation voucher is important. It allows you to register your own unique player ID, or "handle", for use with the PlayStation network gaming service, and guarantees that you will receive future updated versions of the network access disc, which will include features such as the ability to try playable demos of online games. Is the SCPH-50000 model range of PlayStation 2s compatible with the Linux kit? The SCPH-50000 models do work with Linux for PlayStation 2. Please note that as with some of the 39000-R models, you may need to download the updated smap drivers for your network connection to work reliably. No, it does not. The slim SCPH-70000 model PlayStation 2 contains no expansion bay or expansion port; consequently there will be no kit released that will work with this model, and the existing HDD cannot be fitted. In theory, it should be possible to configure a Linux kit to network boot on the SCPH-70000 model, if the kit is configured before use on the SCPH-70000. The diskless client project hosted on our website would provide a good resource for configuring this setup. There was a statement released by Sony which confirms that the hard drive is not supported in the new slimmer PlayStation 2, shortly after the Press Releases and announcements were made. This is also covered in our discussion forums. The EULA is the End User License Agreement that must be agreed to when the kit is purchased. This description is not a legal document and end users that purchase the kit will be bound by the actual terms of the EULA that can be found here . The EULA describes two types of software that are provided in the kit. (1) "Software" with a capital "S" which is everything on Disc 1 and (2) "Third Party Software" which is everything on Disc 2. The EULA restricts what the end user is allowed to do with the materials on Disc 1. They are SCE proprietary contents including copyrighted system manuals and the Runtime Environment (RTE). The EULA says that the end user may not copy or redistribute these materials and may not reverse engineer them or make commercial use of the contents of Disc 1 unless applicable local laws allow such uses. On Disc 2, there are many software packages under many different software licenses such as the GPL , LGPL , BSD and others . The copyright for the source code is owned by many different organizations and individuals. Each package and piece of source code on Disc 2 should be clearly marked with its applicable license. The EULA says that it is the end user's responsibility to abide by these licenses or return the kit immediately. The EULA does not place any other restrictions on the use of materials on Disc 2. Individual licenses such as the GPL do place restrictions on the use of the software so please read these licenses. SCE runs a business that brings enjoyment and entertainment to millions of people worldwide. In order to continue the success of PlayStation and to protect our partners that produce software for our platforms, we must restrict some parts of the system to prevent piracy. With Linux (for PlayStation 2) we have taken an unprecedented open stance and released a huge amount of information that was previously proprietary allowing end users to program the system with very few restrictions. Yes, you can program your own games that will work under Linux (for PlayStation 2). Software that you develop can also take advantage of the PlayStation 2 high performance graphics hardware. You can read some advice on getting started in our Coding for PlayStation 2 guide on this website. There is also a project for hosting guides, tutorials and docs about programming the PlayStation 2 which you are welcome to use and contribute to. The examples included with the kit are located in /usr/local/doc/PlayStation2/libps2dev/sample, read the Coding guide link above if you wish to find out about them and other great samples available through community projects. You might even want to consider submitting your game to a competition such as the Independent Games Festival's annual competition, which accepts entries on the PS2Linux platform. Please note however that you cannot make your own CDs or DVDs that will operate with a PlayStation 2. If you wish to show friends etc your program, you can use Disc 1 and a memory card to boot Linux and run your program. Check out more information in the developers forum. Professional game developers get access to a special version of the PlayStation 2 hardware which contains more memory and extra debug facilities. This hardware, known as the T10K, is a lot more expensive than a commercial PlayStation 2 and is only available to licensed game developers. If you are seriously interested in becoming a licensed game developer, please see this link for North America and this link for Europe and Australasia . In addition to the T10K, licensed game developers get additional support which is part of the reason that the T10K is so much more expensive than a PlayStation 2 console. In terms of access to the PlayStation 2 hardware and libraries, Linux (for PlayStation 2) offers an almost identical set of functionality to that provided to licensed game developers. In fact the system manuals provided with the Linux kit have identical content to 6 of the 7 system manuals provided to licensed developers. The missing information which is provided to licensed developers and not to users of Linux (for PlayStation 2) describes the hardware that controls the CD/DVD-ROM, SPU2 Audio chip and other IO peripheral control hardware. This hardware functionality is still available for use with the linux kit through a software interface called the Runtime Environment. The final major difference between the two is the operating system. A licensed developer creates games for the PlayStation 2 which use a light weight proprietary operating system kernel. This kernel offers much less functionality than Linux, but has the advantage of offering slightly faster access to the hardware. In most cases, it is possible to get almost the same performance with Linux (for PlayStation 2) and the professional game development tools. Yes. As mentioned elsewhere in this FAQ, the hardware details and programming for the Linux kit is almost identical to that provided to professional PlayStation 2 game developers. If you become an expert with developing for the PlayStation 2 hardware using the Linux kit, then this is valuable experience towards becoming a professional. However, such experience should always be combined with good academic qualifications. Yes, but with certain restrictions. If you use software provided on Disc 2, you must follow the restrictions in the licenses for each software package you use. Typically, these licenses will be GPL, LGPL and BSD although there may be others. In addition, the EULA (End User License Agreement) for the Linux (for PlayStation 2) kit restricts the use of materials on Disc 1 - please read the EULA for full terms. One effect of the EULA terms is that you cannot produce CDs or DVDs that can be used on the PlayStation platforms. This limits the distribution of software for Linux (for PlayStation 2) to on-line network distribution. Yes. The PlayStation 2 System Manuals (provided) include detailed specifications on the vector processing units VU0 and VU1, the DMA Controller, the Emotion Engine CPU, the Graphics Synthesizer (GS) and the IPU (MPEG decode assist). Software libraries, tools, device drivers, source code and examples are provided to show how to access this hardware. The PlayStation 2 contains a subsystem for operating peripherals and audio including the SPU2 (Sound Processing Unit), the IOP, the HDD, the DVD drive, controllers, memory cards, USB and other peripherals. The hardware specification for these units is not disclosed. The Runtime Environment provided on DISC 1 includes binary software device drivers for controlling these hardware units. Source code for the Runtime Environment is proprietary and will not be disclosed. However, DISC 2 contains Linux device drivers (with source code) which show how to access all these devices through the Runtime Environment interface. This gives the developer access to the functionality of all the devices but not the complete hardware specification. At this time, we have no plans to release an i.Link (1394) driver. There are 6 system manuals describing the Emotion Engine, Vector Units and Graphics Synthesizer which are provided with the Linux kit on the "DISC 1" DVD ROM in PDF format (both English and Japanese language). These manuals are Copyright of Sony Computer Entertainment. Once you have bought the kit, you can use the manuals and the information contained in them for your own development of software. However, you may not re-produce or copy the manuals or re-distribute them without prior permission from Sony Computer Entertainment. For the avoidance of doubt, that means that the PDFs may not be posted on public web sites and may not be copied for friends. We recognize that many people visiting this site would like to read these PDFs right now - even before they get the kit. We're investigating some possible solutions to this, but for the time being, please be patient and we'll get the kits out as soon as we can. Note that doing this after you have installed Linux will write the new video mode settings to the memory card, and they will be used when you reboot. Some digital TV (DTV) modes are also supported (separate cables may be required for DTV). To configure X to output an NTSC or PAL signal, simply edit /etc/X11/XGSConfig and comment out/in the appropriate lines. To configure the console to output an NTSC or PAL signal, you can use the setcrtmode command, or edit the p2lboot.opt and edit the display variable to be either vga, ntsc or pal. In general, no. The Computer Monitor Cable (for PlayStation 2) (with audio connectors) which is provided in the kit will work with PlayStation 2 software that outputs VESA compatible signals. Currently, there are very few commercial PlayStation 2 games available that output in VESA display modes (varies within territory). Very few games offer alternatives to the TV signal standards NTSC and PAL, which cannot be displayed on most computer monitors. The list is growing however, with games such as Socom offering 'progressive scan' options. Some users have been able to play games that support progressive scan options on their monitors. Please note that playstation2-linux.com does not offer customer support in configuring this to work. Yes. However, you need to make your own arrangements for an ISP. The Linux (for PlayStation 2) kit only comes with Ethernet network connectivity for connection to home networks and high speed Internet services. If you have purchased the Online Gaming Network Adaptor released in the US, a driver has been released to support the modem. You can find it here. Otherwise, it is necessary to buy a USB modem (see list above) to connect to the internet using a dial up analog connection. Also see I want to connect to the internet via my PC, what do I do?. Yes. The DUALSHOCK®2 analog controllers can be used by Linux (for PlayStation 2) applications. The Memory Card (8MB) (for PlayStation 2) can be formatted and mounted as a Linux partition, however game saves cannot be accessed. Can I upgrade the RAM on my PlayStation 2? No. The RAM is fixed at 32 MB. Can I read my own CD-R discs using Linux (for PlayStation 2)? No. The PlayStation 2 is designed not to read CD-R "gold" discs. Only PlayStation CD-ROM and PlayStation 2 CD-ROM and DVD-ROM discs are compatible. No. The DVD Video player that comes with PlayStation 2 can still be used, but it is necessary to shut down Linux and reset first. Can I play my MP3s using Linux (for PlayStation 2)? Yes. Many popular open source MP3 players can be compiled and run under Linux (for PlayStation 2). Some Ogg players, such as ogg123, also work. Yes. The audio output of the PlayStation 2 is enabled for both analog and digital output by default. The digital output is 48 KHz Stereo PCM. You will need a separate optical audio cable. No. The system is only able to read PlayStation and PlayStation 2 CD-ROM and DVD-ROM discs. No. The system is only able to read PlayStation and PlayStation 2 CD-ROM and DVD-ROM discs. You may play audio CDs by first shutting down Linux and resetting the console with the audio CD in the drive. Yes, the Linux (for PlayStation 2) kit does allow for kernel upgrades. The engineering work for porting a kernel to any new architecture is significant. It is not possible to use source code or binary kernels for other architectures directly. We are confident that newer versions of the kernel will become available for download from our site in the future. At present, we don't have any details or release schedules for further updates to be officially released by Sony, however the xRhino project has already released kernel updates. 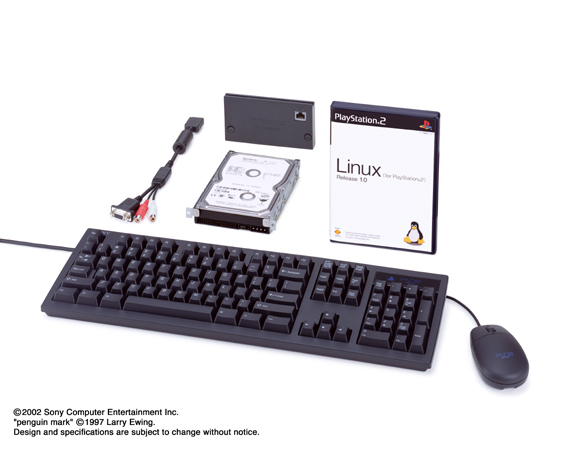 We are selling a kit for the PlayStation 2 that allows the Linux operating system to be used. Under the terms of the GNU GPL (www.gnu.org), the Linux kernel and other GPL licensed software components may be distributed for a fee as long as the source code and license are included. DISC 2 in the Linux (for PlayStation 2) kit meets the requirements of the GPL as well as the other licenses for the software packages on DISC 2. The majority of the cost of the Linux (for PlayStation 2) kit is the hardware; Sony does not intend to profit significantly from sales of the Linux kit. The Linux kit items are not available separately, and at this time there are no plans to make them available separately in the future. The kit is sold out in North America and stock in other territories is selling well at the reduced price;in addition, we do not support users using 3rd party hard drives with PlayStation 2. Which monitors are supported, and what is "sync on green"? Linux (for PlayStation 2) is only compatible with computer monitors that support "sync on green". A significant proportion of standard computer monitors do have this support and will work with Linux (for PlayStation 2). Remember that you don't have to use a computer monitor with the Linux kit; you can install and run Linux on your TV, however you will be working in TV resolutions. All computer monitors require a "sync" signal which determines the resolution of the display. Some monitors require the sync signal to be a separate electrical connection, some monitors require the sync signal to be mixed in with the green video signal (sync on green). Some monitors support both separate sync and sync on green. Some monitors are fixed frequency and do not require sync (very few modern monitors are fixed frequency). The PlayStation 2 is only able to output to monitors that can accept sync on green. Please check the user manual and manufacturer's specifications for your monitor. Unfortunately, the user manuals and manufacturer's specifications do not always specify support for sync on green even if such support does exist. Furthermore, manufacturers make changes to monitors even within a specific model number. It is therefore possible that given two monitors from the same manufacturer with the same model number that one will work with Linux (for PlayStation 2) and the other will not. You can try contacting your manufacturer for information about your specific monitor, or alternatively use the resources listed below. The following four resources may help you determine whether your monitor is sync on green compatible. We now have over 600 entries, mostly submitted by members of the PlayStation 2 Linux community who have purchased the kit and used it with monitors that they have access to. We cannot guarantee the accuracy of the information in this database, however it is in everyone's interest to keep it as accurate as possible, so it may offer a good indication of whether your monitor is sync on green compatible. A list of compatible monitors published by SCEI in Japan. This list is provided for informational purpose only and represents monitors which have been reported by our beta testers to work with Linux (for PlayStation 2). SCEA has not tested all these monitors for compatibility. Your experience may differ. This list is by no means complete and will continue to be updated. If your monitor is not on the list, this does not necessarily mean that it will not function. In addition, there are several links to sites that are operated by Japanese Beta testers with extensive lists of monitors. These sites are independent of Sony Computer Entertainment. We can make no guarantees about the accuracy of the information on these sites. Also, the sites are mainly in Japanese language. A list of monitors found to be compatible by an independent test. Again, we cannot guarantee the accuracy and completeness of this information; your mileage may vary. The EDID Editor tool by ViewSonic. This is a Windows platform tool, which retrieves your monitor EDID data, and allows you to see all the translated settings and capabilities from that data. To use it, download, install, then run the tool. Select File -> "Retrieve EDID Data" and then click on the "Translate EDID" button in order to view your monitor data. For sync on green compatibility, examine section (20): "Video input definition". If "sync on green" is listed there, then there is a strong chance that your monitor does support sync on green.Please note that SCE cannot guarantee the reliability of this information. If you wish to use a monitor that does not support sync on green, there are two adaptors that users have reported as working successfully with the Linux kit (as of FAQ revision #12). These are the Blaze VGA adaptor, and the Software Integrators' Sync separator. Neither Sony nor SCE are affiliated with these companies and do not offer any support or guarantee for the usage and quality of their products, however these products may be of interest to some of our users. Make sure you really are using DVD 1. This catches out more people than you might think as DVD 1 is actually the disc at the back of the DVD case. Have you connected the kit to a TV? DVD 1 boots in VESA mode by default which will only be compatible with a sync-on-green monitor. If you have a PAL TV (Europe/Australia) you need to hold down Select + R2 as you boot to select PAL. If you have an NTSC TV (USA & Canada) you need to hold down Select + R1 as you boot. In either case, hold the keys down right from the moment you power up the PlayStation 2 to the moment that you see the blue boot screen (the "PlayStation 2 splash screen" is not enough..keep holding). Are you using a monitor? If so, you need to make sure it is sync on green compatible (see "What is sync on green"). If your monitor is sync on green compatible, but you still can't see anything, try booting with Select + L1 to ensure you are booting in VESA. Hold the DualShock keys down for about 30 seconds. Next, power off and then power back on your display. Sometimes this can help the monitor to recognise the sync on green signal. Some users may find that switching between video modes, or running some graphics demonstrations/examples causes the monitor to lose signal. This can happen when the monitor cannot sync on green at some frequencies. To bring the signal back try using the setcrtmode command. If your PC connects to the internet using a dial-up modem and phoneline, you will just need one cross over cable between your PlayStation 2 and your PC. If you have broadband internet access over ethernet, then you will need both your PS2 and PC connected to a router/hub, or two network cards in your PC, and normal network cables. To connect your PlayStation 2 to the internet via the PC, you will need to run a proxy of some sort to give your PlayStation 2 access to the internet. Recent versions of the Windows operating system include "internet connection sharing". If you enable this, then all you have to do is run 'netconfig' on your PlayStation 2 as root, and enable the "DHCP" option at the top, and hit 'ok'. Recent versions of MacOS X have the same feature. If you are running Linux, you will need to read about how you can set up your machine as a proxy using rules and IP forwarding. If you are running an older version of windows there are a variety of free proxies around that might work for you - you could try 'HHProxy'. At the end of the install, at the screen that says "Congratulations! Installation is complete!" It asks you to press enter, then swap the DVDs. Did you do it in that order? It's really important. You need to hit enter, wait until you see 5 or 6 lines of unmounting messages, and then swap the DVDs and reset after that. If you swap discs first, the system can't finish unmounting the partitions, all the files get messed up, and things go very wrong with the install. X not starting is a very common symptom of this. You might need to re-install & watch this last part of the process carefully. Yes, our users have contributed several written guides about using the kit. We've created a project for hosting these guides, take a look! Richard Jackson (flashlct) has written a new users guide, which is particularly useful if you are new to Linux in general. The learning curve is pretty steep so we do recommend at least some familiarity with Linux - but this guide can help you to get started. You can easily change your current window manage by running the 'sdr' tool at the console (eg not in X) to set your window manager before you startx. If you compile your own window manager you need to create an entry for it in /etc/X11/xinit/session.d - have a look at the existing ones for examples. Then sdr should find it the next time you run sdr. As a general rule, Linux is not prone to viruses in the same way that Windows users can suffer them when opening email attachments, etc. However, it is important to know that older versions of open source software have often had security vulnerabilities revealed, which have been addressed by new patches and versions of the software following the discovery. 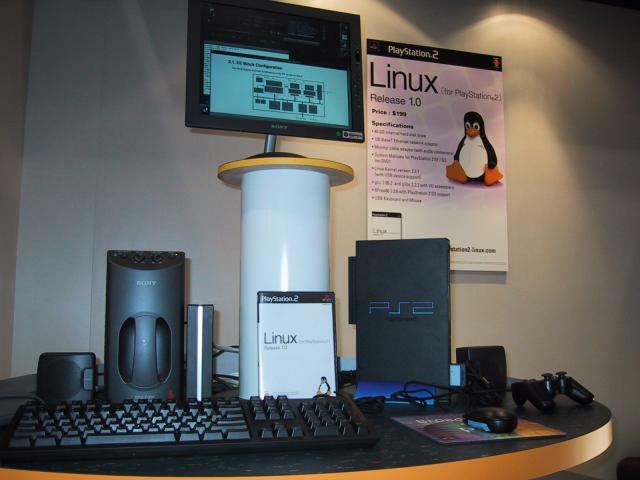 The versions of Linux software included in Linux for PlayStation 2, including the system kernel, are in some cases significantly behind the most recent existing sofware versions. This is likely to remain the case in the future, as new software must be compiled for the PlayStation 2 processor before it can be used by Linux for PlayStation 2 users (one reason why the "Compiled For Your Convenience" project exists). If you connect your PlayStation 2 directly to the internet, with no NAT, firewall, internet connection sharing or proxy - say, to use it as a real webserver - then you will be vulnerable to any exploits that take advantage of known vulnerablities in the software you are running. This only affects those users who are directly connecting their PlayStation 2 to their cable modem, or using a dial up modem. The risk can be reduced by making sure that services that are not required such as ssd, httpd, telnet, etc are shutdown. If you are using your kit as an internet server and this concerns you, there are mailing lists such as SecurityFocus' "bugtraq" where people post newly found vulnerabilities. You need to edit X's config file, which is /etc/X11/XGSConfig. Cronocloud wrote a great forum posting on how to do this. Alternatively, you can do "startx -- -screen 0 PAL" or "startx -- -screen 0 NTSC" at the command line if it's a once off. Your first port of call should be our user discussion forums. However, if you like to use IRC, there are two unofficial IRC channels on freenode.net: #ps2linux and #sps2. "Linux" is a trademark or registered trademark of Linus Torvalds in the United States and other countries. 02/13/02 : version #6 : Removed references to i.Link (1394) support due to earlier misunderstaning. There is no 1394 driver support at this time. 03/13/02: version #10: Added "What does the EULA actually mean ?" 03/13/02: version #10: Added "What are the differences between the Linux (for PlayStation 2) development environment and that used by professional game developers?" 03/13/02: version #10: Added "Will experience with Linux (for PlayStation 2) help me get a job in game development?" 03/13/02: version #10: Added "Can I sell games or software that I develop using Linux (for PlayStation 2) ?" 01/20/03: version #11: Added link to the discussion forums under "Who is it aimed at?" 01/20/03: version #11: Added "How does this distribution work and what is it based on?" 01/20/03: version #11: Fleshed out "What is NOT in the kit?" 01/20/03: version #11: Reformatted "What is in the kit?" 01/20/03: version #11: Added extra line to "Is the HDD compatible with PlayStation 2 games?" 01/20/03: version #11: Updated "Can I use the monitor cable with commercial PlayStation 2 games and a monitor?" 01/20/03: version #11: Updated "Can I connect to the Internet?" 01/20/03: version #11: Added video mode selection to "Can I use my TV as a display?" 01/20/03: version #11: In "Can I use the DUALSHOCK®2 and Memory Card (8M) (for PlayStation 2) under Linux (for PlayStation 2) ? ", added that game saves cannot be accessed. 01/20/03: version #11: Extended "Can I upgrade the kernel?" 01/20/03: version #11: Small addition to "I thought Linux was free - so why are you selling it?" 01/20/03: version #11: Updated " Which monitors are supported and what is "sync on green"?" 06/03/03: version #12: Added "Can I play networked games online using the Network Adaptor?" 06/03/03: version #12: Added "Are there any other distributions I can use?" 06/03/03: version #12: Added "Alternatives" section to "Which monitors are supported..."
06/03/03: version #12: Updated "What is NOT in the kit to mention analog modem in commercial US network adaptor. 02/03/04: version #13: Added "I can't see anything on the screen"
02/03/04: version #13: Added "I want to connect to the internet via my PC, what do I do?" 02/03/04: version #13: Added "I try to start X and it fails with err no. 146? 02/03/04: version #13: Updated "Can I use the monitor cable with commercial PlayStation 2 games and a monitor?" 02/03/04: version #13: Updated "Can I play my MP3 and Ogg files using Linux (for PlayStation 2)?" 02/03/04: version #13: Updated "Can I program PlayStation 2 Games under Linux (for PlayStation 2)? 04/23/04: version #14: Added "Are the new SCPH-50000 model range of PlayStation 2s compatible with the Linux kit?" 04/23/04: version #14: Added "I'm learning how to use Linux, is there a newbie guide?" 04/23/04: version #14: Added links to the howto and system-howto projects. 04/23/04: version #14: Added location of graphics samples included with distro. 04/23/04: version #14: Added "I'm not sure how to change my window manager?" 04/23/04: version #14: Added "I'm worried about viruses and security"
04/23/04: version #14: Fixed link to Blaze adaptor. 06/21/04: version #15: Added "I want to start X Windows in PAL or NTSC on my TV, how do I do that?" 06/21/04: version #15: Added "I'd like to chat with other PS2Linux owners"
09/29/04: version #16: Added "Does the new slim SCPH-70000 series PlayStation 2 work with the Linux kit?" 10/14/04: version #17: Updated availability information (mainly for New Zealand). 03/03/05: version #18: Added "I have a Network Adaptor, USB keyboard, and hard drive; I just want the DVDs separately!" 07/04/06: version #19: Updated price and USB keyboard/mice availability in Europe. 11/26/07: version #20: Updated price and availability information.